Storms drive little birds to seek shelter, but the eagle flies higher because of the storm. 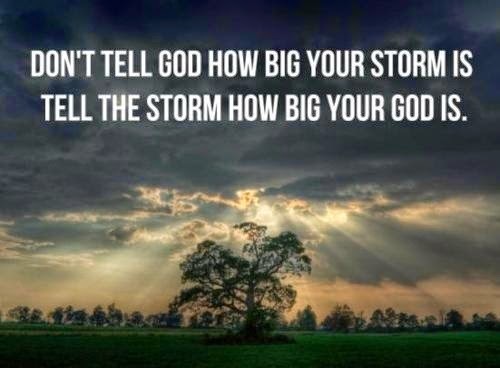 Storms drive some from God—others they drive to God. A vessel was almost driven onto a rocky coast during a storm. Contrary to orders, one man went on deck. He saw the pilot holding the wheel unwaveringly, slowly turning the ship back out to sea. When the pilot saw the man, the pilot smiled. The man went below saying, "All is well, I saw the face of the pilot and he smiled." Hudson Taylor said, "It does not matter how great the pressure; it matters only where the pressure lies, whether it comes between you and God, or whether it presses you closer to his heart." The same pressures come to the good and the bad, but how they abide them proves the character. Someone has said, "With Jesus in the vessel, I smile at the storm. Fear sees the storm; faith sees God in the storm. 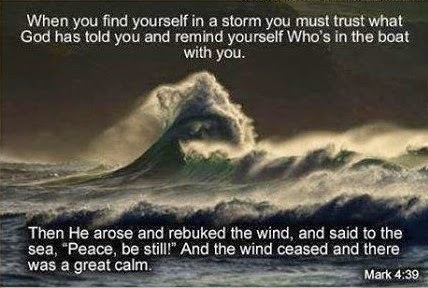 Jesus Christ is no security against storms, but He is perfect security in storms. He does not promise an easy passage, but He guarantees a safe landing." When the Titanic was built, it was called the "unsinkable ship." Yet the world soon learned that this was not true, for the vessel sank after hitting an iceberg. Contrary to the Titanic, with Jesus in the ship of our lives, no matter how severe the storm, we are unsinkable with Him as our pilot.